You've found the smartest way to book Florida vacations. Click a price below to see our unique vacation grid. It's very fast and has a calendar format for easy comparison. Our agents have been to most resorts - call us and we'll help you decide which hotel is right for you. Florida offers a worry-free sun vacation in a place that appeals to families, couples, and singles. Package holidays to Orlando, Tampa, Kissimmee, Ft Lauderdale, Miami, and other Florida highlights are reasonably priced. Choose Florida if you like the familiarity and convenience of malls, movie theatres, theme parks, and chain restaurants with the bonus of beaches and fantastic weather. Sunning and swimming are popular activities on a Florida vacation, as well as visits to Disney and other attractions. Getting Around: It’s important to rent a car in Florida as getting around without one is expensive and inconvenient. The only time you might not want to rent a car is if you are staying put at a Disney Resort and are satisfied to eat all meals either in the Disney theme parks or at the Disney hotels. Where to Stay: We offer hotels and condos from budget to luxury, close to Disney and other attractions. If you’re staying in Orlando, choose from a wide variety of resorts like Disney Contemporary Resort or Buena Vista Suites that has a shuttle to the theme parks. The Gulf Coast offers condo and hotel accommodations along a strip of interconnected islands. Starting in the south, Sarasota and Bradenton areas offer a more up-market feel to your holiday. Higher end restaurants and manicured properties contrast to the neon and fast-food nature of St Pete's Beach. Quieter condominium accommodations along the Maderia, Indian Shores, and Indian Rocks lead to another strip in Clearwater Beach. 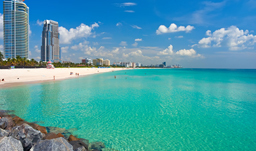 East Coast Florida includes the ritzy West Palm Beach area, the more suburban-like Fort Lauderdale area, and the sizzling nightlife of Miami's South Beach, all within a two-hour drive. Weather: A mild, sunny climate is an alluring factor of Florida vacations. Average temperatures range from 18-21C in the north and 23-25C in the south. During the summer, temperatures average 30-35C with common rainfalls. In the winter, temperatures average 17C. Florida vacations are affordable and flexible. There is so much to see and do, visitors can choose from many dynamic cities and points of interest. Our travel agents can find the perfect Florida vacation based on your budget and preferences.